That being said, the book is fairly substantive in spite of its brevity. One advantage of reading about these men within the larger context of this project is I often learn about them over the course of many books rather than just within their individual biographies. As you would no doubt imagine, the "Founder of the Constitution" plays a fairly prominent role in nearly every historical account I have so far read. That being said, I've found that, perhaps predictably, the larger more comprehensive biographies, say McCullough's John Adams, provide considerably more depth and perspective into the lives of these men than a shorter volume can possibly offer. Madison was, unquestionably, a brilliant man. Socially awkward and sickly throughout his life (Washington Irving famously described him as 'a withered little Apple-John'), he was third in the so-called "Virginia Dynasty" that made up four of the five first Presidents. Madison was, like Jefferson, born into a prominent Virginia planting family and also like Jefferson, Madison didn't fight in the Revolution but did serve in the Virginia House of Delegates. He attended the first and second Continental Congress before going on to help organize the Constitutional Convention. He was the primary author of the Bill of Rights (though he opposed it), and eventually went on to win election in the U.S. House of Representatives. Though he favored a strong federal government during the debate over the Constitution, and collaborated with Alexander Hamilton and John Jay in its defense in The Federalist, he eventually came to be known as a staunch Republican, as he and Jefferson effectively created America's first political party. He served as Secretary of State in the Jefferson administration and went on to serve two terms as President, presiding over the War of 1812. Madison did and said a number of improper things while he was at Princeton, writing abusive poems about students who belonged to the other of the college’s two debating societies. Madison’s squibs are filled with talk about whoring, pimping, chamber pots and other sophomoric paraphernalia. Another hilarious moment comes when Hamilton and Madison, while chatting on a New York City street, "laugh and play with a monkey that was climbing in a neighbor’s yard.” God, I would have loved to have witnessed that. 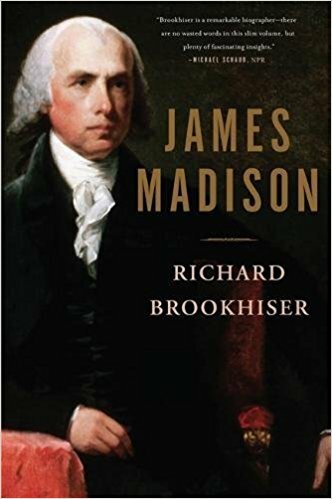 Ultimately, the reader comes away with an impression of Madison that would feel appropriate in describing so many modern public figures: a man occasionally willing to compromise principles for political expediency, seeing fit to shift his political philosophies to suit his best interests. As Brookhiser points out in the book's conclusion, "he supported a stronger national government when he expected to be influential in it and stronger state governments when his power base shifted to that level."